Just like Facebook’s affair with Timeline format feature, photo viewer changes had its share of positive and negative feedback. 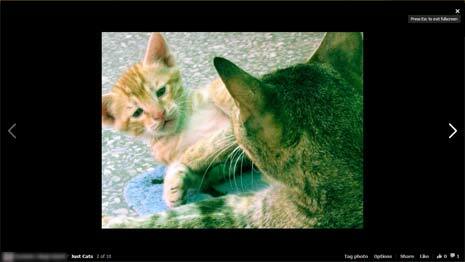 With introduction of lightbox style Facebook photo viewer, many users explored ways to disable Facebook photo viewer and use the old in-line photo display viewer. Over the period of time, Facebook photo viewer feature has matured and new avatar with full screen mode feature looks very promising (atleast for Facebook users who love to browser photos). Facebook has updated photo viewer with full screen photo viewing feature. Also, with internal improvements – now photos should appear more clear, colorful and crisp. New Photo viewer allow browsing of Facebook photos in full screen mode showing you every possible detail. 1. 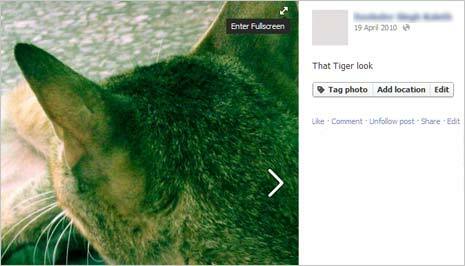 To switch to full screen mode of Facebook photo viewer – click to open any photo on Facebook and point mouse at top right area of the image. You should see double headed arrow, click on it to enter full screen mode. In full screen mode, new photo viewer will attempt to display maximum possible (available) resolution of specific photo. For sure, this looks much better (and you won’t be looking for ways to disable this feature). 2. To exit full screen mode of Facebook photo viewer, press the ESC key. Alternatively, you can click X button at top right area of image while in full screen mode.